Krige Schabort was only 24 years old and serving as a corporal in the South African army when a bomb blast altered his life. I sat down and spoke with Krige about that fateful day. The date was November 02, 1987, Schabort and his fellow soldiers had taken over an enemy base and had set up camp in an old broken down convent. The troops were in a relaxed mode while sitting around outside the camp awaiting further orders. Though relaxed, they were always aware of their surroundings. That afternoon, fighter jets began to fly over the area. His first thought was that the jets were friendly forces en route to attack a base further out. The jets flew over and then back towards South Africa. Five minutes later, Schabort heard the loud roar of four Russian fighter jets as a bomb landed just two yards from his body. Schabort never saw the jets and before he could run for cover, his body was thrown into the air. His buddy, who was next to him saw the bomb coming down and screamed at Schabort to run, however, Schabort could not hear him for the loud roar of the fighter jets. As Schabort lay on the ground between the buildings, he saw his mangled legs and realized that he was in real trouble. He could feel a wide aching gap in his stomach. As the sound of the explosion reverberated in his ears, a fellow soldier appeared and informed Schabort that he would get help for him. Schabort noticed that his foot was lying atop his chest. He pushed the foot aside and began to pray as he had never prayed before. The field doctor was out on patrol and not on base that day. A medic arrived and treated Schabort for shock. Due to the severity of the injuries, the medic was unable to treat the wounds. Fellow soldiers gathered around Schabort with a bible. They read Psalms 23 and prayed. Schabort drifted in and out of consciousness as he awaited rescue. The responding units were aware of an enemy presence in the area armed with surface to air rocket propelled grenades that could take out a helicopter. Schabort was wrapped in a sheet and taken from the area by truck to a safe location in which to meet the helicopter. It was almost dark when help arrived and Schabort cannot remember anything other than the bright lights of the chopper. At a nearby field hospital, the Dr. started surgery to stabilize him, once sedated; Schabort went into cardiac arrest. He was revived by an adrenaline injection to the heart. Two days later, he was transported to a military hospital in South Africa. His parents arrived the same evening. That night, Schabort went into a coma. Doctors discovered that the shock wave from the bomb blast had exploded his stomach. A portion of his stomach along with one yard of his small intestine was removed. Both of his legs and one finger were amputated. Schabort spent the next year in a military hospital. He recalls the repetitive nightmare of being hit by a truck, his body being trapped in the rolling wheels unable to escape and unable to die as the truck continued rolling. 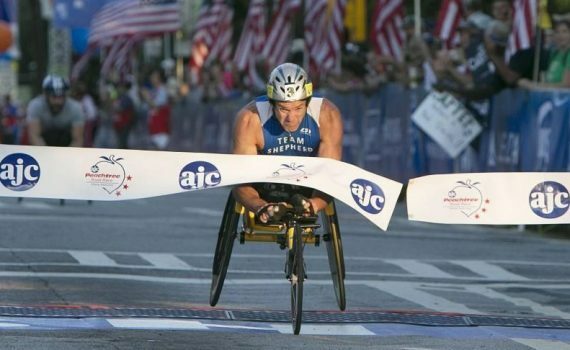 By the end of the second year of recovery, Schabort was introduced to the sport of wheelchair racing. Growing up in South Africa, Schabort was very athletic. He enjoyed surfing, rugby and squash. Determined not to let his disabilities keep him down, Schabort began training his body to compete. When I asked what inspired him, Schabort replied that he was inspired by being alive after his near death experience. EDITOR: Krige Schabort has been nominated for an ESPN Excellence in Sports Performance Yearly Award.